Chapel 8 offers four wedding packages to choose from. Chapel is located at 616 South 3rd Street. 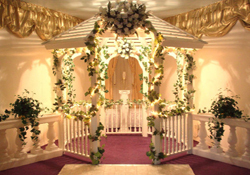 This chapel's ceremonies are performed in a romantic indoor gazebo with a lovely water fountain. All packages include a live internet broadcast and 30 day web archive of your ceremony. This chapel is perfect for small intimate weddings for two or can accommodate up to 25 guests. Bridal parties welcome with any package. A personal and professional wedding coordinator will assist you in planning your special day. Professional photographers will capture all of your cherished memories from the moment you arrive at the chapel until you leave as husband and wife. A courteous and professional staff takes pride in making your wedding day as memorable as it can be. Other services available: complete tux and gown rentals, bridal accessories, bridal supplies, hair & make-up. Minister fee $60.00. Photographers work for tips $40.00 and up suggested. Packages do not include sales tax, (8.1%). Balance is due 15 days prior to wedding ceremony. Weddings booked within 15 days of ceremony, requires package payment in full.